After being named the Global Ambassador for the Toronto Raptors back in 2013, Drake has taken his relationship with the NBA's lone Canadian franchise to a new level with the renaming of the team's practice facility. Formerly the BioSteel Centre, the Raptors' training facility will now be known as the OVO Athletic Centre. 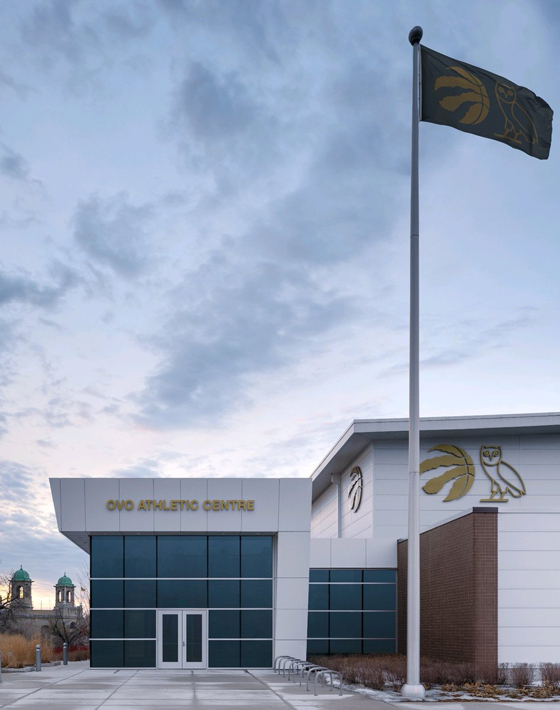 Located just outside of the city's Exhibition Place, the building has already been outfitted with OVO's iconic owl logo, on top of a black and gold flag. A press release notes that the rebranding will also include "interior redesign elements that reflect the Raptors and OVO brands" and that the Raptors will soon be sporting "practice jerseys featuring the OVO owl logo," which will be available for purchase later this off-season. "Drake and OVO are an important part of our city's landscape, our team's identity, and our plans to bring a championship to Toronto," Raptors president Masai Ujiri said in a statement. "With each step of our partnership over the last five and a half years, we have worked together to build a winning basketball program in Toronto and deliver for our fans and our community." A video announcement shared by the team shows Ujiri presenting Drake with his own key to the facility. TSN reporter Josh Lewenberg noted that Ujiri flew to Manchester, where Drake was touring earlier this week, to make the presentation. The announcement comes ahead of tonight's "Welcome Toronto" game featuring the Raptors versus the Los Angeles Lakers. Last year, Drake and the team donated $1 million to refurbish community basketball courts in Toronto, while also pledging $2 million to Canada Basketball as part of their "Welcome Toronto" initiative. What shouldn't be lost in this news is that the Raptors have taken another big step forward in keeping a certain superstar happy. Drake also recently announced plans to reopen his Pick 6IX restaurant.